Some last minute Tesco shopping and then we were on our way to the water point at Newbold. A boat appeared from the opposite direction just as the tank was full. He wanted water so Jan left the tap unlocked. As we passed the the boat he told us another boat was behind him in the Newbold Tunnel; so we loitered near the tunnel portal until the second boat had exited and then motored through. The tunnel is dual but going solo makes navigation easier. I’d already telephoned Lime Farm Marina to enquire about the price of diesel. The line was engaged the first two times and then it went to answerphone for the remaining three. After that I gave up! There’s another boatyard on the right (northern side) after the tunnel. They had three fuel signs on display. The first we could see stated £1.11 60/40 split. I’m not interested in a 60/40 split. As we passed opposite the fuel bowser there was a second sign. Fuel from 80p any declaration. Now that’s what I want to see. But the third sign said No Fuel. @#$%^&*….. Oh well, we’ll check on the way back! We were on unfamiliar water once we had passed the entrance to Brinklow Marina. Perhaps that’s not strictly true as we cruised the Warwickshire Ring in a clockwise direction in 2005. so we would have gone down the North Oxford rather than up it. As we approached Bridge 30 I said to Jan “I think I remember a pedestrian swing bridge around the corner”. And I was right! The canal bisects Rose Narrowboat base and they have a small pedestrian swing bridge that needs to be opened in order to cruise through their base. We don’t have a photo as it was raining. Further along we passed under the M6 motorway. Both of us questioned how many times we must have driven over the canal without realising it was below. There is a water point at Ansty Village and as it came into view we could see a small CRT tug on the water point. The crew of two also saw us approaching and frantically untied their mooring ropes to get out in front of us. I just slowed down as we’re not in a rush. The same couldn’t be said for the CRT tug which was making a huge wake as it raced off ahead of us. However he was slowing down when passing moored boats. 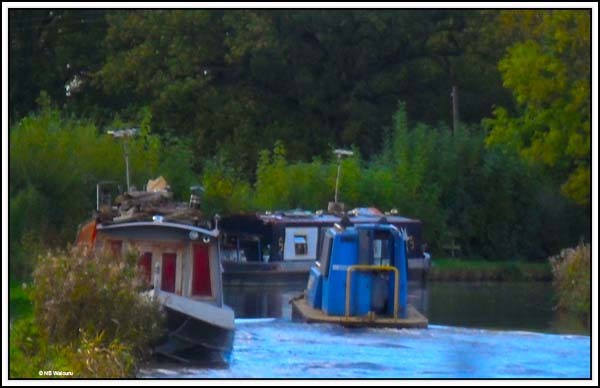 There had been no sign of any CRT work between Rugby and Ansty so we wondered why they were out on the boat. Was it a “Jolly?” (going off and having a good time). 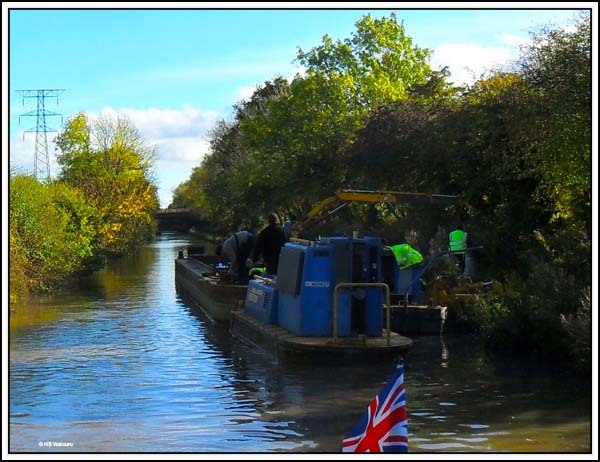 Our question was answered just after bridge 7 where we found a maintenance crew upgrading the towpath. They had two barges; one of which had a small excavator; and they were clearing the waterlogged topsoil before placing down some geotextile matting and back filling with fine aggregate. 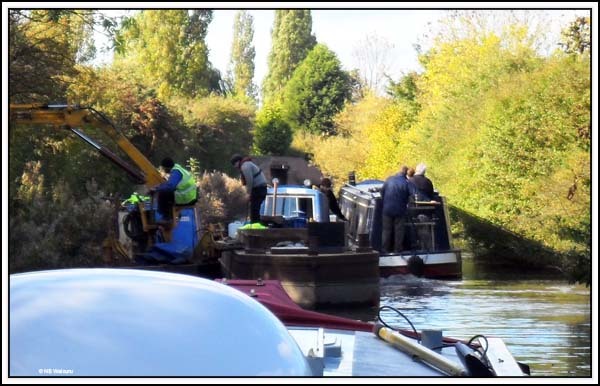 The CRT tug crew were moving the barges beside the towpath. It was a squeeze getting past without damaging the paintwork, but we managed. This stretch of the canal is visually attractive, however I wouldn’t moor here because the M6 motorway is on the other side of the hedgerow. Jan noticed a couple of boats on mooring rings at Bridge 4. The crews looked like they were off to the Elephant & Castle pub, a short distance up the road. We carried on and found a vacant 7 Day mooring just short of the stop lock at Hawkesbury Junction. The DTV aerial is up and the TV is set to record the latest episode of Poriot. The Roadpro has also found the “dot in the sky” so both bases are covered for tonight. Not a bad mooring there, that's where we stop when going that way. Are you heading into Coventry or turning right for Atherstone? I love reading your blog keep it up. Yes, it is a good mooring and tomorrow we turn left for Coventry Basin. We have to be back in Rugby next week. "Jones multi anchor plates". I so have to get a couple of these. My 1st ever night mooring there was no piling, no bollards, & the ground was so soggy & soft I could just push my mooring pins in with my foot. The pins came out 3 times during the evening, it seems every 3rd boat that passed would pull them out, & they came out again early in the morning about 6am. Sorry to hear that. The anchor plates really do work. If the ground is very soft you can link them together with a pin through the end holes to make a Y or triangle shape which makes an even better ground anchor.